Yurika Ninomiya says good morning to busy central Nagoya from her third-floor bedroom while husband Takuya opens up the shop and gallery that they run below. Architect Makoto Tanijiri’s firm custom-designed most of the furniture in the building, including the steel-and-paulownia dining table. The western wall, folded like a paper screen to provide strength, adds another jolt of visual interest. 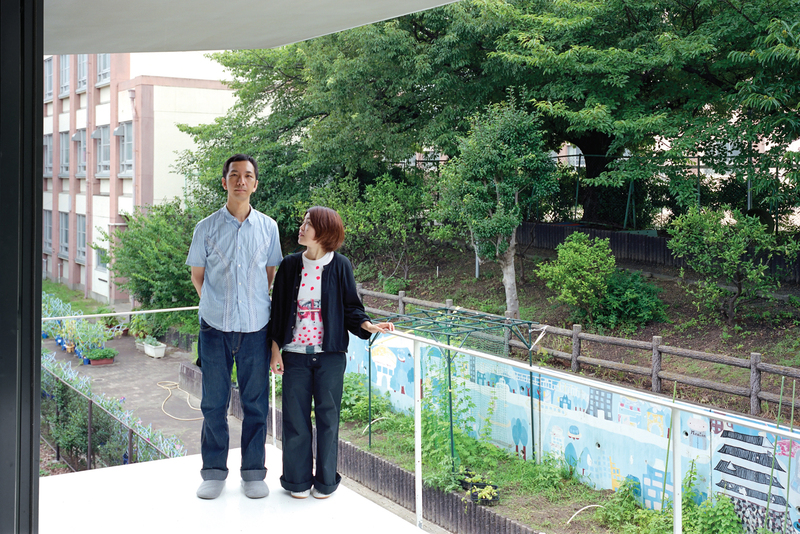 Without a garden of their own, Takuya and Yurika enjoy the verdant view of the schoolyard cherry trees next door from their bedroom balcony. The structure is an elegant riff on the boxy apartments and school that surround it. Custom-made paulownia cabinets and a roomy balcony keep the compact second-floor living-dining-kitchen area from feeling cramped or cluttered. A steel spiral staircase efficiently links all three floors. With no interior doors, Yurika can keep an ear on the shop from upstairs while maintaining the privacy of her home with the help of the vertical distance. The bedroom has a view of the cherry trees. The bedroom and bath share a glass wall. Grown-up visitors have to hunch down to enter the teahouse and additional gallery space behind the building, but kids from the neighboring elementary school are able to slip right in to check out the art. The teahouse is lit by Isamu Noguchi’s classic mid-century Akari 1AS lamp. Takuya and Yurika Ninomiya always dreamed of opening a gallery together. As art lovers, the couple had hoped that if they were lucky, they’d be able to do so after Takuya retired from his job at a printing company and Yurika from hers as a flower designer. But when the Ninomiyas decided to buy their first home, they realized this was their chance. If they commissioned a building incorporating three spaces—a gallery, flower shop, and residence—into one, they’d be able to finance their fantasy. 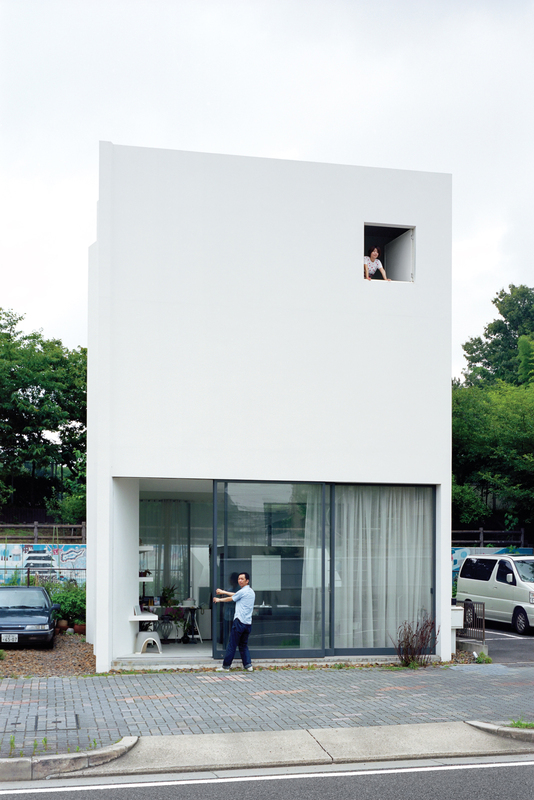 So in 2005, they purchased a plot of land in a residential district not far from downtown Nagoya, Japan, and began searching for an architect. They wanted a modest-size building that was interesting in its own right. Talks with a string of firms in the area, however, left them disappointed, and after a year of searching, they still hadn’t found anyone with an innovative approach for combining the three spaces in a single building. By contrast, Makoto Tanijiri was the embodiment of the avant-garde architect the couple was looking for. In 2000, at age 26, he launched his own firm, Suppose Design Office, and soon his work was popping up in trendy magazines. One of the houses he designed resembles an abstract glass-and-steel geode and another looks like a black pyramid with a skylight at the top. The Ninomiyas were intrigued. They felt a bit intimidated about contacting someone from the glossy world of their coffee-table magazines, but by the summer of 2006 they were desperate enough to try calling his office in Hiroshima. To their surprise, Tanijiri arrived a few days later to look at the property and talk about ideas over drinks. He was ready with a proposal a few months after that. In the time between, the couple waited eagerly. “We were expecting something really out there,” says Takuya, a tall, genial man with a master’s degree in modern art history. 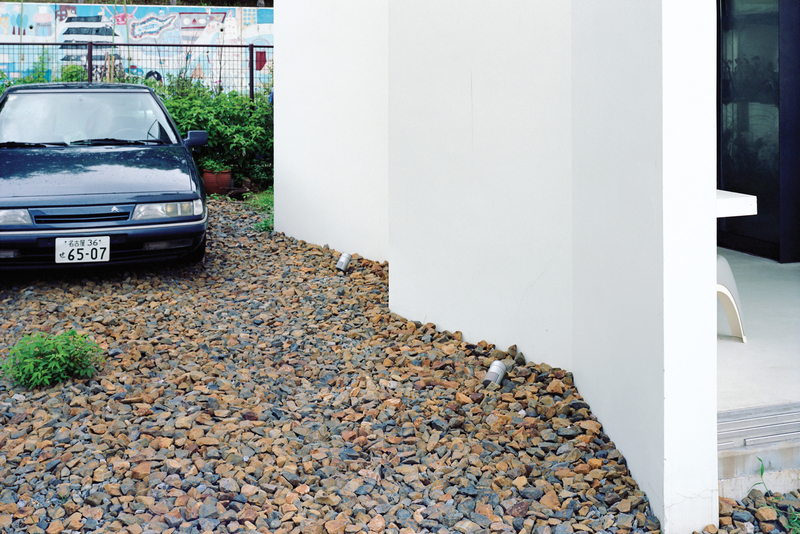 The concept was what he called “a new kind of normal”: a structure that appeared ordinary on first glance but that would reveal its uniqueness the more time one spent in it. Tanijiri didn’t want to design something strange for the sake of strangeness. Instead, much like Jasper Morrison and Naoto Fukasawa, the design duo behind the renowned Super Normal exhibition, he was trying to find the core of good design within a ubiquitous form. Rather than dividing flower shop and gallery, private space and public, the structure would elide those distinctions. The couple went for it, and the house was completed in December 2007. While calling it “normal” may be a bit of a stretch (for the most part, Nagoya’s architecture is so drab that even a well-made box stands out), Takuya and Yurika agree the 1,115-square-foot concrete structure (with a footprint of just 480 square feet) otherwise lives up to Tanijiri’s original concept. The building is composed of three nearly square rooms stacked on top of each other. In front, cars whiz past on a busy six-lane thoroughfare; behind, a lush row of cherry trees stands between the property and an elementary school playground. The design responds gracefully to the urban setting. A windowless white facade shields the top two floors from street noise, while sliding glass doors comprising the front and back walls of the ground floor give a glimpse of the schoolyard to passersby. “The clients wanted the flower shop and gallery on the first floor, and I thought it would be interesting to create a sense that the flowers were being displayed outside,” Tanijiri explained. “I came up with the idea of a tunnel-like structure, where the green of the playground would be captured on the street side.” The concept was a clever update of classical Japanese garden design, where “borrowed scenery” such as nearby mountains and forests have been incorporated into landscapes for centuries. There was just one problem with the plan: A house with solid ten-foot-tall windows making up the front and back walls would be structurally weak. One possible solution was to thicken the sidewalls, but Tanijiri wanted something different. 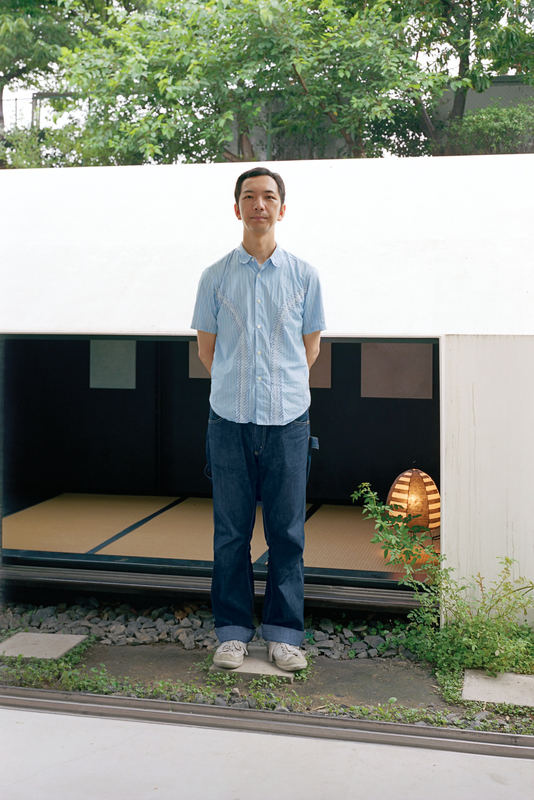 Consulting with Kenji Nawa, his preferred structural engineer, Tanijiri decided to add strength by bending the western wall like a folding screen. The indented form also lent a sense of depth to the relatively small rooms, and Tanijiri repeated the same angular folds, this time horizontally, on the first- and second-floor ceilings. He then ran electric wiring and plumbing lines along the triangular pockets that were created, neatly combining form with function. Inside, Tanijiri kept the plan as open as possible, combining the flower shop and gallery into a single room. The choice was one based on philosophy more than aesthetics: “If you handle flowers and art in the same way, the flowers themselves begin to seem like art, and the art seems closer to everyday life.” The arrangement has encouraged Yurika, who runs the shop, to experiment with the interaction between the two mediums. She often creates flower arrangements to display in tandem with the artwork and says the gallery has influenced the way she thinks about flowers. “It inspires me much more than an unchanging setting would,” Yurika says. Fitting both a flower shop and a gallery into just over 400 square feet, however, required an unusual layout. To keep the walls free for hanging art, Tanijiri housed both flower refrigerator and bathroom inside a large, black steel box in the center of the room. The outside of the box becomes a display surface, while the high ceilings and huge windows keep the bulky object from crowding the room. Tanijiri added additional gallery space directly behind the main building in a tiny teahouse constructed from bent one-third-inch-thick steel and lined with tatami (straw mats). The structure looks like an avant-garde storage hutch with a door built for a hobbit, but inside it is remarkably cozy. One is tempted to sit in prolonged contemplation of the painting or two on display and the slice of tree branches visible through the long, high window. In fact, the gallery as a whole invites casual lingering. Kids often stop in to see the art on their way home from school and other visitors tend to stay and chat, too. “It feels like they’re hanging out in our home,” Yurika says. That sense of overlap between private and public comes in part from Takuya and Yurika’s genuinely warm personalities, but it’s also built into the design. The Ninomiyas enter their home via the shop, because there is neither a separate door to the residence nor a formal entryway—particularly unusual omissions in Japan, where even the tiniest apartments include an entry area for exchanging greetings and removing shoes. The building also has no interior doors. Instead, a white spiral staircase in a corner of the shop disappears into a round hole in the ceiling, emerges in the second-floor living room, and then continues to the third-floor bedroom. “The distance creates the privacy,” Tanijiri says. And it’s true: Sitting upstairs at the custom-made wood- and-steel dining table, designed by the architect, the shop feels comfortably far away.